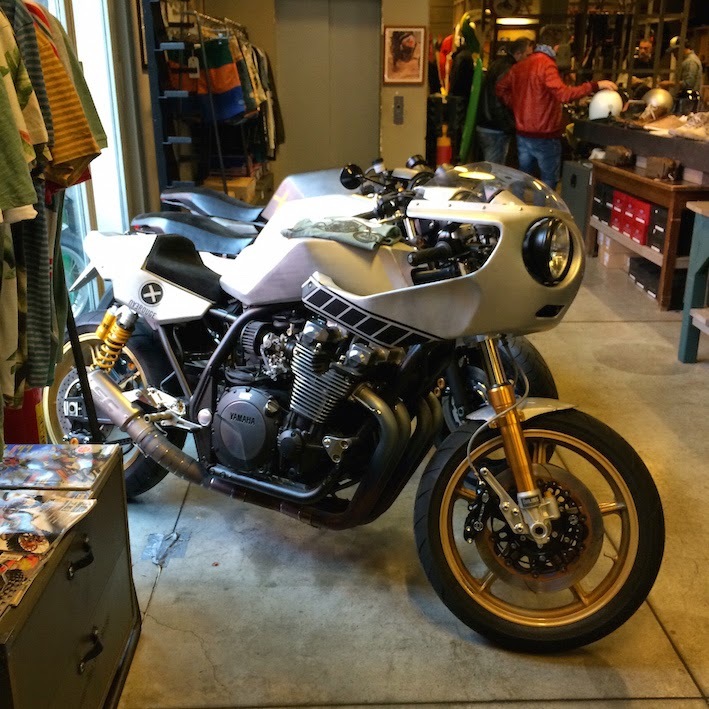 My trip out to Deus Ex Machina in Milan was a one-night whistle stop, but a lot of fun. I was asked to be one of five judges for the annual Deus Bike Build-Off. This is the first of two or three posts on the trip. 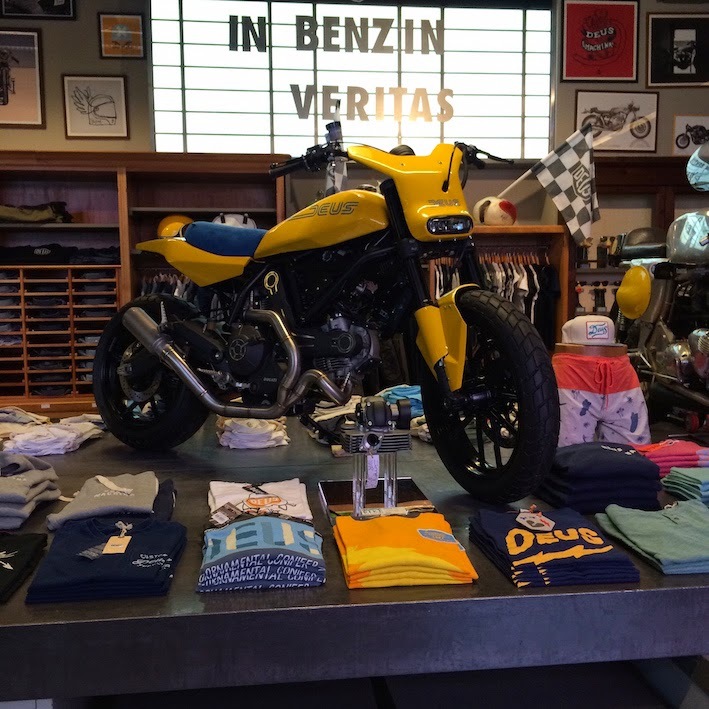 I thought I'd seen so many good bike-clothes-lifestyle boutiquey shops I'd be immune to the charms of the Italian Deus, but I was blown away. 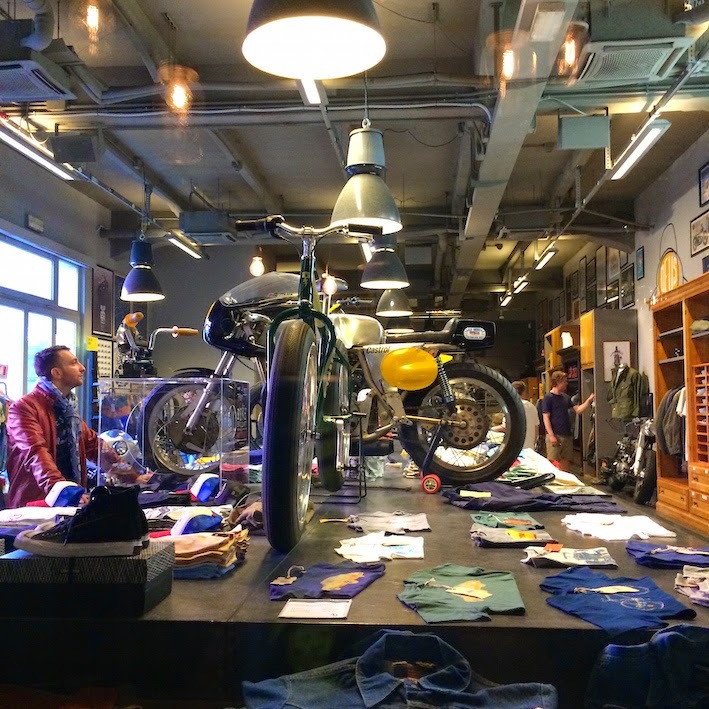 It's a great shop with eye candy everywhere. 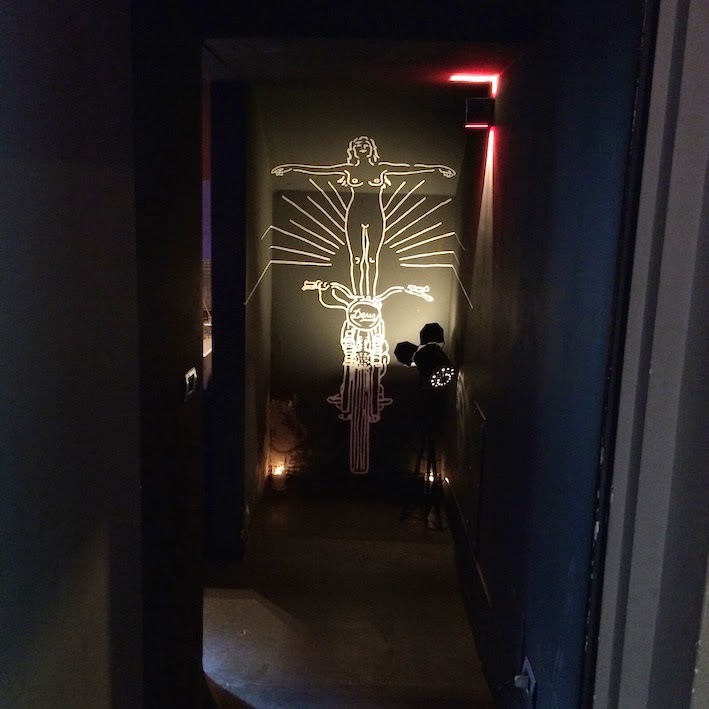 I'd seen the place at it's pre-opening party in November 2012, but it was nothing like it is now. The shop opened in March 2013. I took my kids (my wife was away with her sisters for a birthday bash). They were happy hanging out in the cafe on Saturday evening and Sunday, and playing with the co-owner's children. The store has its own courtyard and feels enclosed and cut off from the world outside. 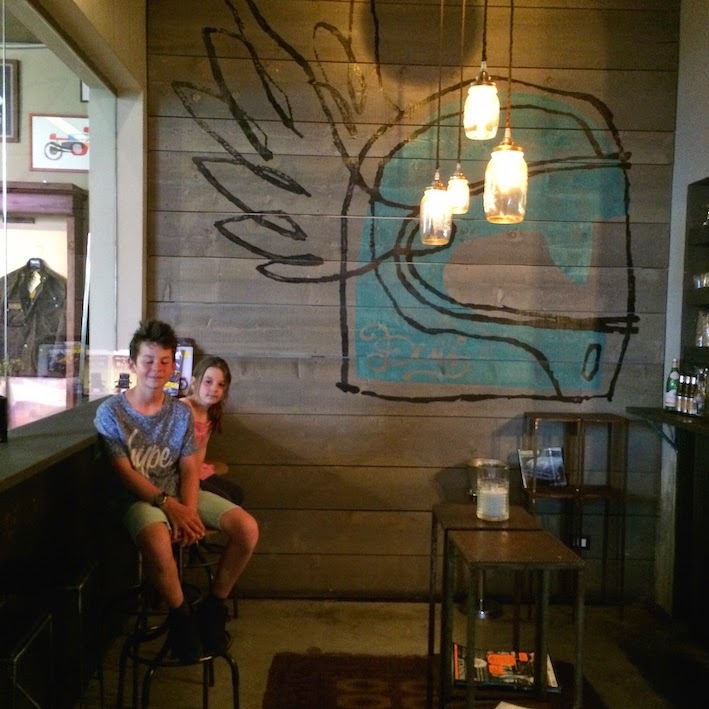 The Carby artwork on the walls is the business. 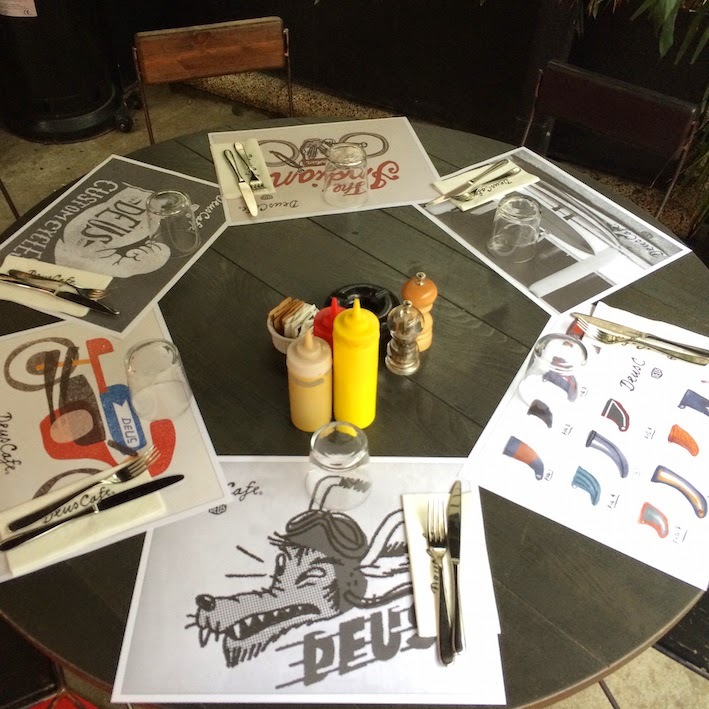 If you want to read an interview with Deus' design maestro, Carby Tuckwell, order Sideburn 7. Eau Rouge, the Deus x Yamaha Yard-Built XJR1300 is a rare and handsome beast with some tasty, quirky touches. 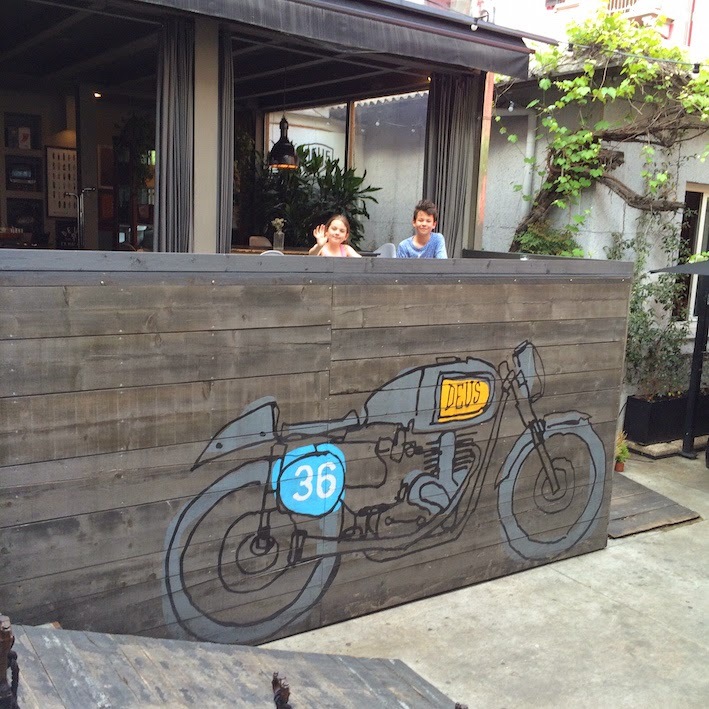 The attention to detail in the adjoining Deus Cafe is fantastic. If you're in Milan, get over to this place. It's located on Thaon di Revel, a five-minute walk from the Zara underground station. 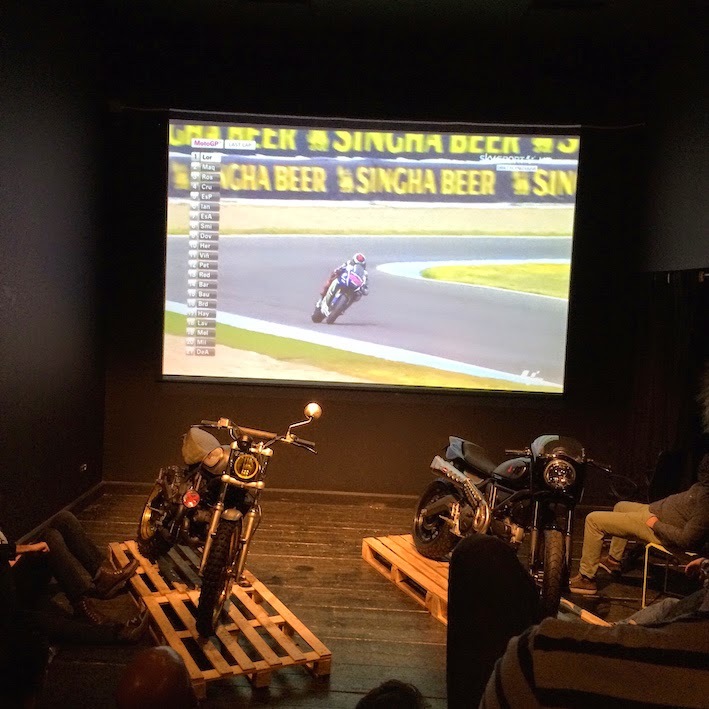 The shop also has its own mini cinema and showed the MotoGP (not the most scintillating race) for the bike builders who entered the Build Off. You can see the scale of the place. The shot is taken from row 3 of 8 or 9. 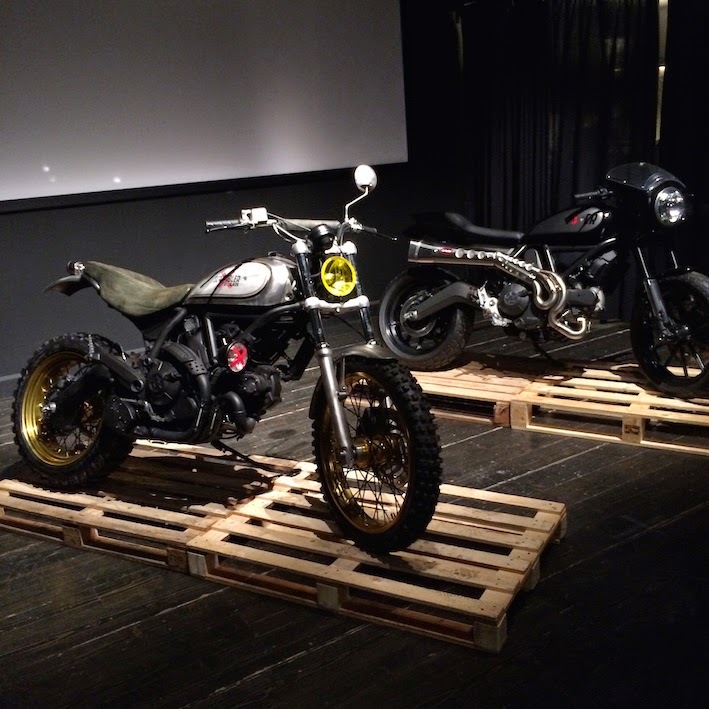 The bikes are the Scrambler special editions commissioned by Ducati. 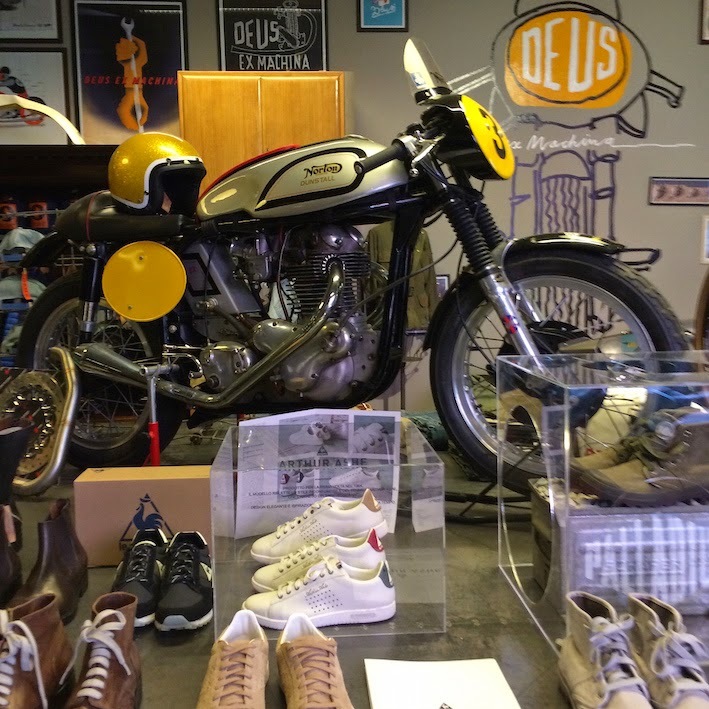 These were built by Deus's neighbours on the same street, Officine Mermaid and Mr Martini of Verona. 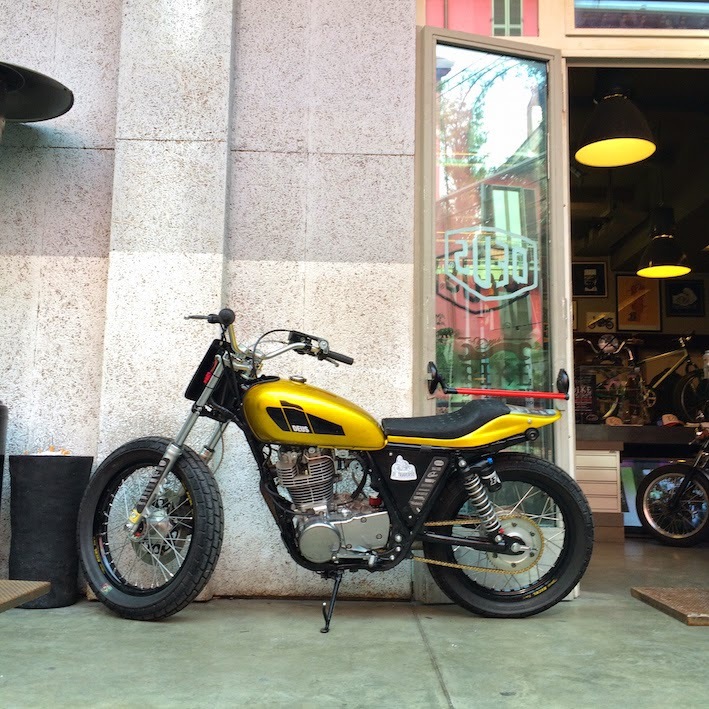 Deus's own Scrambler is the yellow one in the top shot of this post. 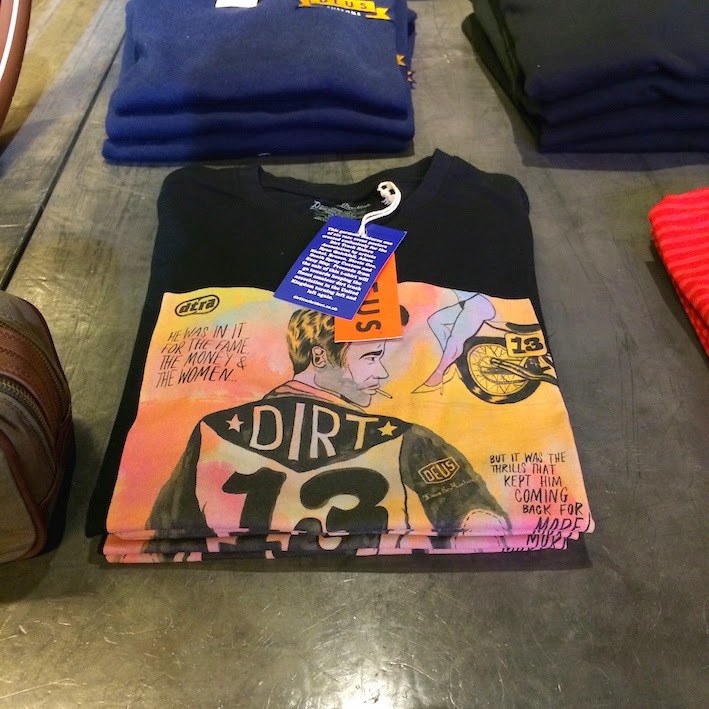 The shop had a few of the Deus x DTRA T-shirts that were made using the artwork Sideburn commissioned for the 2013 DTRA x Sideburn Posters. This is the Stevie Gee one. 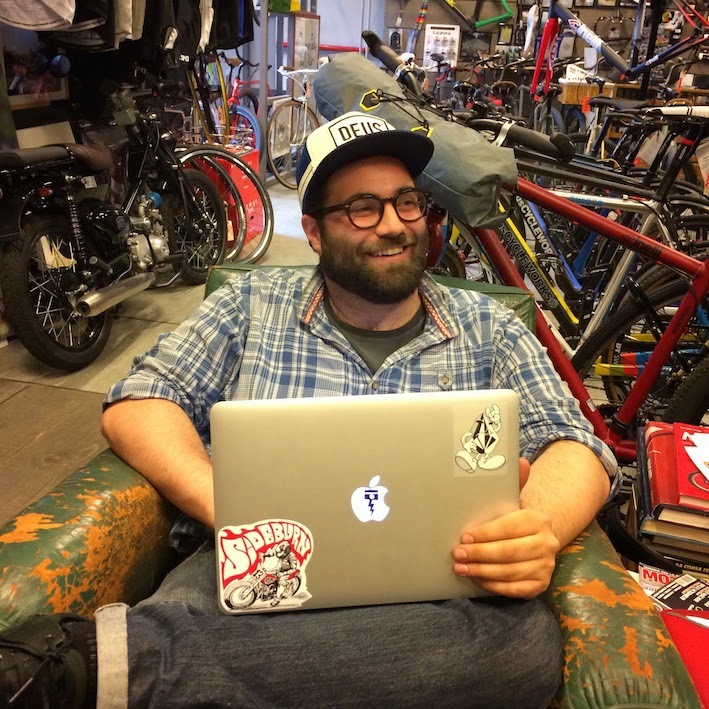 Umberto works in Deus cycle works. He had a sticker of me, that Chris Watson drew, on his laptop. 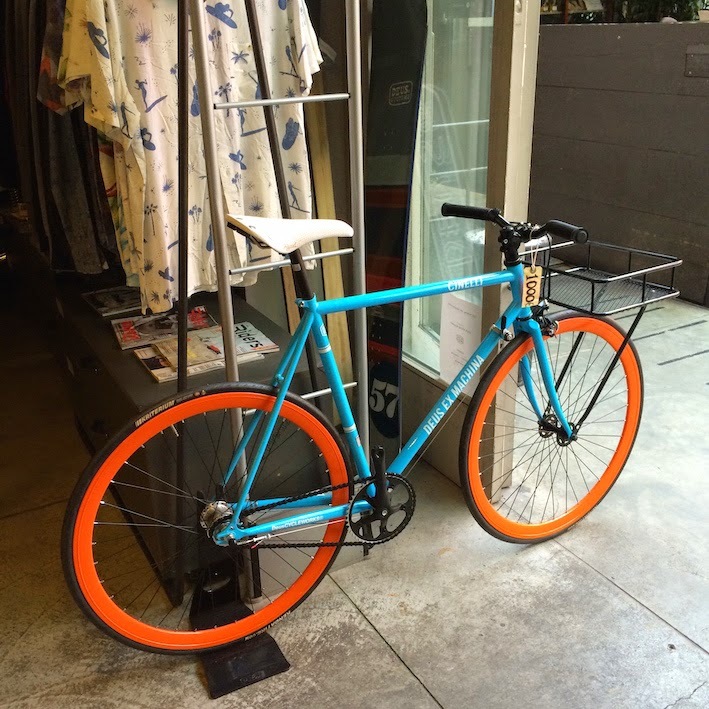 I've never owned or even ridden a fixie, but I've always liked the look of them. Especially with a basket on the front for delivery of Sideburns when the fuel runs out (I haven't totally thought this scenario out yet). 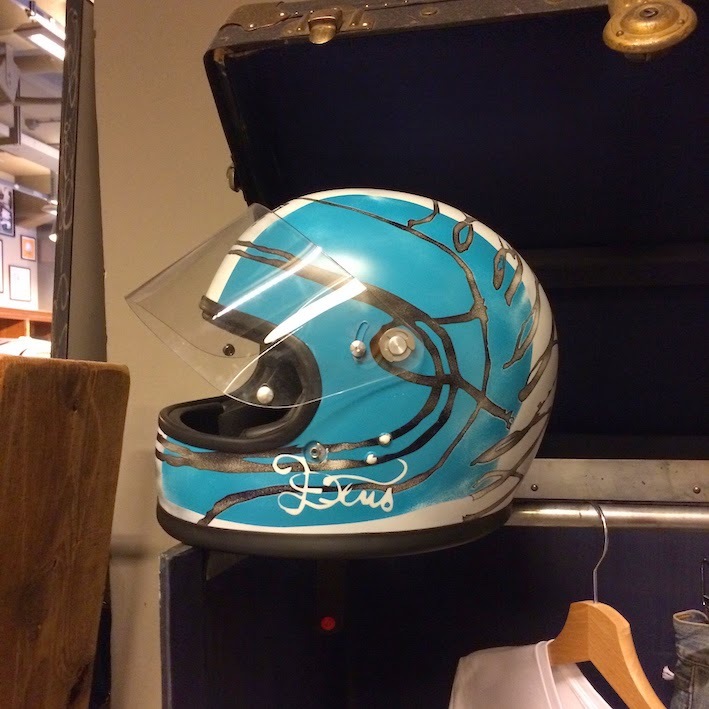 Deus are one of the main partners of Marco Belli's Di Traverso flat track school. 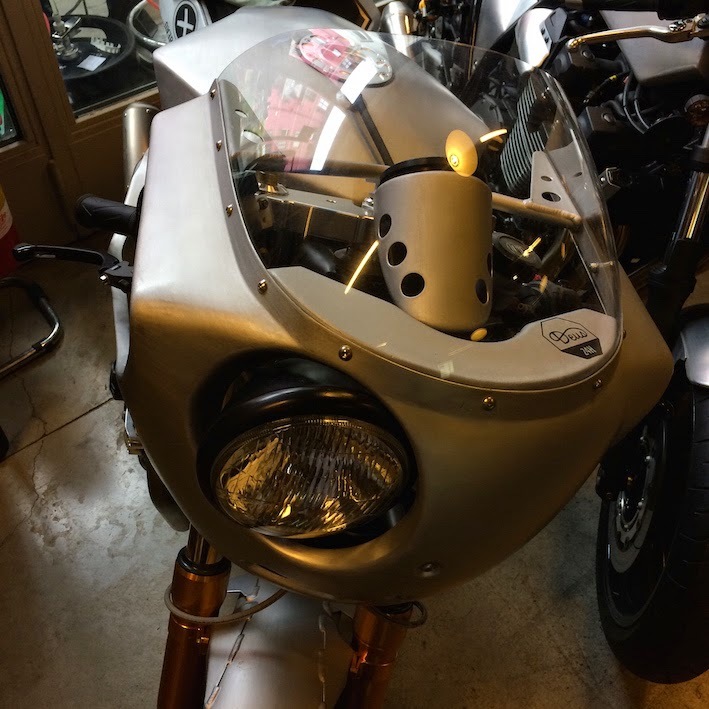 This is one of the Yamaha SR400 school bikes. 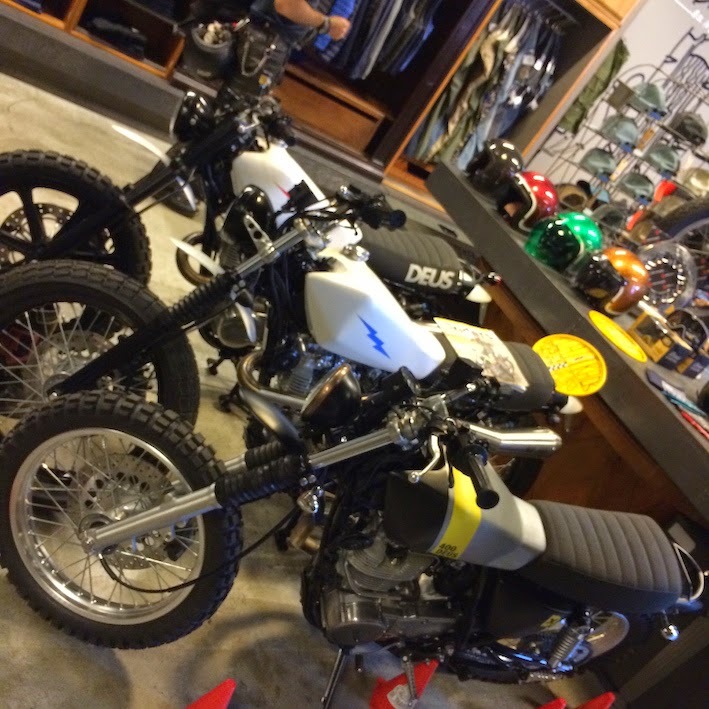 More tasty Deus Yamaha SR400s. The end of the corridor to the toilets. 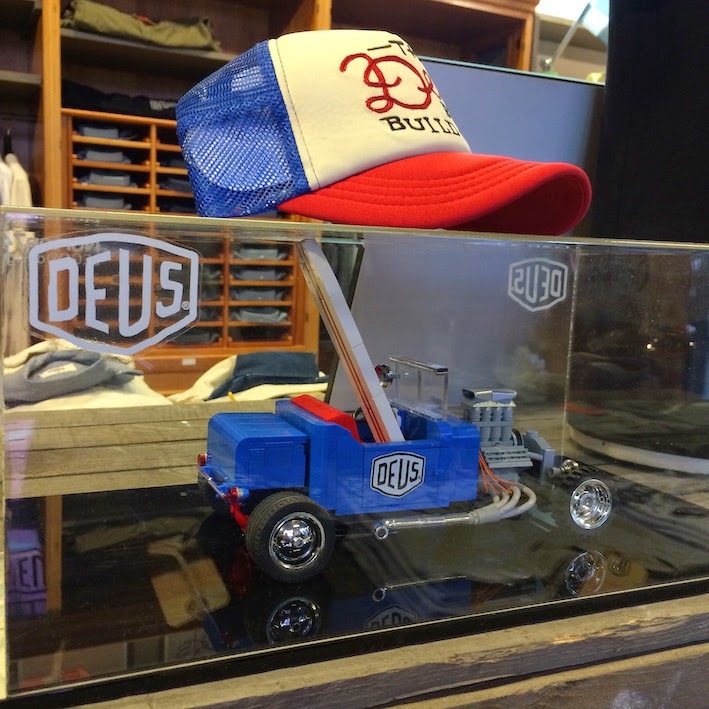 One-Off Deus Lego hot rod.